Black threatens to cut off a white group and White has to take defensive measures. White 1: White has to connect at 3, of course, but this intermediate atari gives additional points and is sente. Black 2: Black saves a stone keeping alive the threat to cut. White 3: White connects, otherwise the cut off group would die and the dead black group in the top corner would return to life. BillSpight: If Black cuts, White can win the semeai in the corner with a reply at a. However, White loses 3 1/2 points in the corner and quite a bit in the center and top side, as well. The connection at White 3 is big. Black 4: The move prevents White from saving a marked stone. It is interesting to compare the value of this move with the value of White 5 in the game. The most interesting question of the position is who wins a ko at the top. It is a good place to note that most weak amateurs are afraid of ko. We see an example of quite a large ko here that both players try to avoid. But, naturally, one of them is able to win it. Thus one of the players is wrong. Black 1 on the diagram threatens to capture four white stones at the top. White has to answer 2 and start a ko. This ko is fairly large. Playing at a, Black could force White to connect at 1 in sente, but this will probably give him 1 point more than what happened in the game. But that would be a safe variation if Black did want to fight it, becaue White could also force ko. 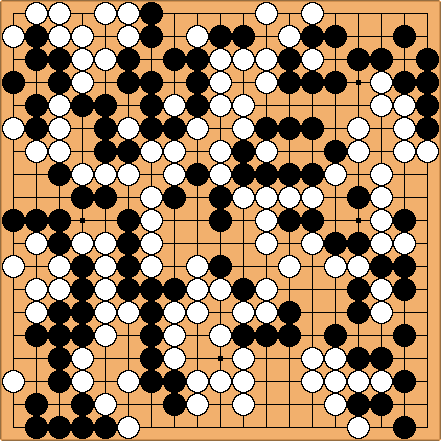 White 5: White threatens to capture two black stones, taking some territory from Black. At this point of the game White was behind, so, perhaps descent at with following ko was a better move. White avoids ko as Black did on the previous move. Black 6: This move saves two black stones. But is this the largest move on the board? White 7: White connects her stone and threatens to take two black stones. Thus this is a local sente play. Black 8: Captures White's stone and saves one of his own. White 9: Having got sente at the top, White defends her territory. Black 10. Black connects, preventing White from saving the marked stone.